title: Refracted Sociality: Rethinking Interpretive Sociology. The twentieth century faced thinking with a number of challenges related to events that left an imprint on the lives and memories of many witnesses and victims. The Holocaust, Chernobyl, the totalitarian regimes, the new forms of biopower and control became part of a collective experience that was almost impossible to articulate. This applied also to all human sciences, which had to find the strength to confront that experience. Sociology was faced with the difficult task of finding ways to think about the unprecedented, about that which had no precedent in history in terms of its monstrosity. It became necessary to find an appropriate perspective that would allow a more humble theoretical position guaranteeing that the phenomena under study would not be subjected to generalizing operations and loss of their uniqueness. Hannah Arendt’s dictum that non-understanding is the starting point and basis for any understanding is important in this sense. 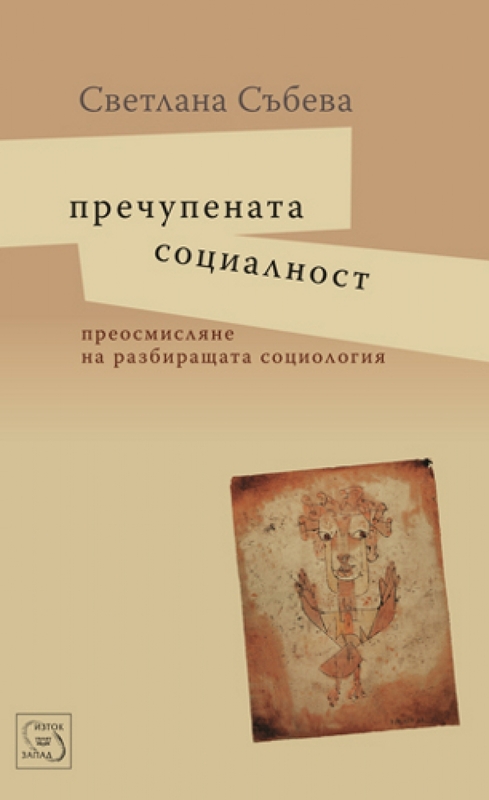 Svetlana Sabeva’s book Refracted Sociality: Rethinking Interpretive Sociology, where she outlines new possibilities for thinking about the unprecedented, is a significant achievement in this respect. According to the author, the classic interpretive sociology (verstehende Soziologie) of Max Weber and Alfred Schutz does not have enough tools for understanding the exceptional, that which transcends everyday experience. In this sense, the sociology of the unprecedented can be thought of as a counterpoint to the sociology of everyday life, as a ‘switch’ from one type of hermeneutics to another. This switch is hinted at even by the cover of the book which features Paul Klee’s Angelus Novus, the painting that inspired Walter Benjamin to write some of the most profound and moving reflections ever on the experience from history, its messianic potential, and the need for empathy with the victims. Svetlana Sabeva’s insightful analysis of classical sociology draws on the work of Martin Heidegger, and more specifically, on his hermeneutics of facticity and the existential analytic of Dasein. This approach to thinking about the social allows the author to address the problem of the temporal structure of understanding, and of the event as its starting point. This is the ambitious task she sets herself, namely, ‘to experiment with the limits of sociology under the sign of Event’. The event dispels the notion of the empty, homogeneous and linear passage of time where historical facts form a sequence, and introduces another concept of time in which complex constellations between present, past and future are formed. Such an understanding allows one to think of the possibility that things might be different, that is to say, it allows one to think of the possible, and not of the historically necessary. It presupposes looking at ‘fluid events of awakening’, at revelatory moments of everyday experience when sensitivity is particularly heightened. Thinking ‘under the sign of Event’ also enables the social sciences and philosophy to address the scandal of the unprecedented in a way that ensures empathy with the victims, and to look ‘not for the truth of facts but for the truth of meaning’ (p. 17). Chapter One (‘Interpretive Sociology “After Auschwitz”’) addresses the problem of interpretive sociology ‘After Auschwitz’ and of the semantic adequacy of sociological concepts. They must be able to account for this scandal and to understand the unprecedented on its own terms. This requires abandoning the generalizing procedures of classical sociology and ‘approaching the shock of the [Auschwitz] experience’ and the collective sense of unreality. Sociological concepts must meet certain requirements in order to be able to think about the singular: they must be regressive concepts, that is to say, they must make possible temporal ‘games of illumination and definition’ which thematize simultaneously the present and the past; they must be ‘loose concepts with a narrow scope and rich content’ (p. 22) that allow one to examine the uniqueness of the singular; they must be related to the autonomy of action, which would allow one to speak of important concepts such as motive, responsibility or guilt; they must be ‘hermeneutically founded in terms of unprecedentedness’ (p. 24) so as to preclude justification of the unprecedented. Svetlana Sabeva gives examples of such concepts in the work of Hannah Arendt: the banality of evil, forgiveness, homelessness, self-analysis ‘After Auschwitz’. Thinking ‘under the sign of Event’ also presupposes overcoming the traditional distinction between theory and practice. Theory includes in itself a non-theoretical, elementary-reflexive field. Thus, affective experience becomes an important part of sociological research and its explication will help realize the project of thinking ‘After Auschwitz’. The study of affective experience sets the horizon of temporality and historicity of human being in the world from the perspective of the phenomenon of caring about one’s own being. This pre-reflexive position could help bring about the encounter between everyday experience and sociological theory against the background of Heidegger’s hermeneutics of facticity. It proves to be very helpful in rethinking the ‘refractions’ of experience that reveal the singular and the exceptional, as well as in creating an analytic of action through temporal structures. Following this line of thought, in Chapter Two of her book (‘Understanding and Affectivity: Pierre Bourdieu and Max Weber’) Svetlana Sabeva shows how a number of phenomenological concepts related to the temporal structure of affective life can be explicated in the theory of practice. This is also done through a very productive dialogue between Husserl, Heidegger, Arendt, Bourdieu, Weber, and Schutz, in which some main intuitions that are merely hinted at by those authors are expounded. This includes, on the one hand, the sociologizing and historicizing of concepts related to pre-predicative experience, the existential analytic and the hermeneutics of facticity, and on the other, explicating Heideggerian ideas that remained implicit in the later Bourdieu. As a continuation of that dialogue and as an example of the noted method of work, Svetlana Sabeva offers at the end of Chapter Two a very profound comparative analysis of Max Weber’s concept of Beruf (‘vocation’ or ‘calling’) and Pierre Bourdieu’s illusio (belief in the reality of social games), in which she shows both some similarities and some main differences between the two thinkers. The problem that remains open and whose solution is to be found in Heidegger is ‘how should hermeneutics be related to facticity in order for it to be constituted as self-interpretation’ of facticity (p. 95). This applies also to the relationship between understanding and temporality, discussed in Chapter Three (‘Understanding and Temporality: Martin Heidegger’). In Heidegger’s philosophy, time is involved in revealing the meaning and in the structures of care as a moment of pre-reflexive attitude to the world. Human beings are thrown-in-the-world but, at the same time, they project their being-in-the-world. Thus, Dasein configures the ecstatic temporal unities towards future, present, and past. Affirmation of those three temporal ecstases with an accent on the future allows one to think of the meaning of an action in terms of the action itself, that is to say, allowing it to reveal itself in its own uniqueness. According to Svetlana Sabeva, by thinking with and through Heidegger in a manner that overcomes some limitations of his programme one can arrive at an understanding of time that is based on the moments of ‘refraction’ of experience in which numerous ‘ecstatics of absence’ and of the radically foreign can be grasped. Thus, in forgiveness, testimony, admission [recognition?? ], narration, one can see different approaches towards a complex relationship between the possible and the impossible, between ‘the irrevocable this-and-not-another-being’ and ‘it could have been otherwise’. Hannah Arendt’s work attests precisely to such a continuation of Heidegger’s philosophy in terms of thinking about the unprecedented. According to the author, against the background of these reflections the idea that Heidegger could help us to better understand the Holocaust no longer sounds so strange. Svetlana Sabeva shows how this can be done by introducing negativity as a main existential of Dasein. The so-called privative phenomena indicate a new possibility, namely, the possibility of the impossible which is revealed by a phenomenology of the absent. Chapter Four (‘Affectivity and Negativity: Towards a Praxeological Conception’) expounds the idea how privation ‘realizes the structural connection between temporality, affectivity, and world’ (p. 166). This structure, which places Dasein at the point of intersection of thrownness-in-the-world and projection, maps out new directions of rethinking affectivity and the experience of the negative. In this way, a meaningful background is created which would allow rethinking interpretive sociology and constituting a ‘sociology of affectivity’ that pays special attention to certain liminal phenomena as well as to some completely ordinary and unnoticeable experiences such as those described, for instance, by Virginia Woolf. In my opinion, the approach used in this monograph has succeeded in brilliantly coping with the difficult task of conceiving of an expansion of the limits of sociology and, at the same time, of proposing a solution to the very topical question of how a singular phenomenon can be understood in its uniqueness and specificity when it is not merely an object of reflection but exists ‘under the sign of Event’. Svetlana Sabeva – Refracted Sociality: Rethinking Interpretive Sociology.